Processed with a special formula of double-boiled linseed oil, and is cut with-the-grain for extra rigidity. Is lubricated with each cut, extending the life of your stencil machine, and resists ink absorption so the same stencil can be used many times. 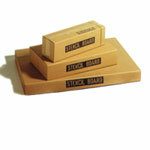 Stencil board Dispensa-Pak comes in 23LB boxes.